One of Victor Mlotshwa’s attackers can be seen attempting to shove him into a coffin in video footage. 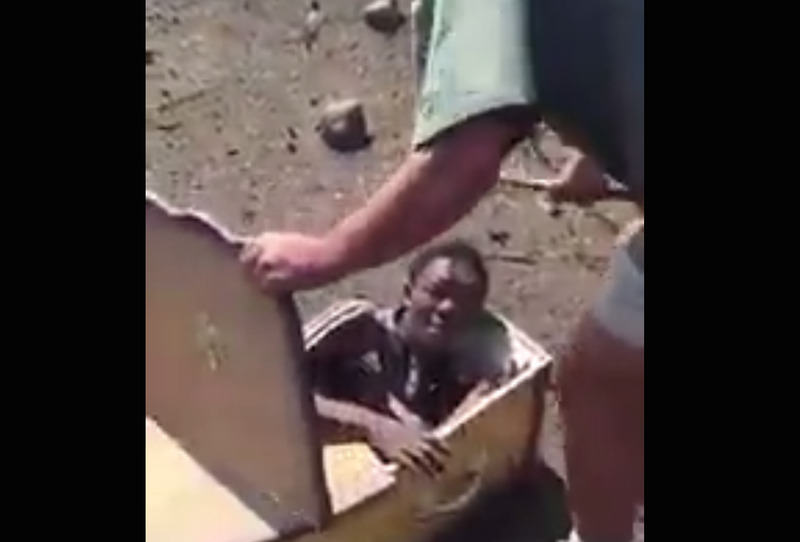 Horrific footage that has since been taken down from YouTube shows a black South African man's harrowing ordeal as he was forced into a coffin by two white men who threatened him. According to the Washington Post, Victor Mlotshwa was walking and minding his own business when he was approached by two white men who accused him of trespassing on a ranch. Before Mlotshwa could run away, he said, the men forced him into a coffin that happened to be nearby. The men then threatened to pour gasoline on him and set him on fire. One of the men recorded the awful incident. In a short clip of the video shared on Twitter by the Economic Freedom Fighters, one of South Africa's main political parties, one of the men can be seen attempting to close the coffin over Mlotshwa's head as he cries. According to the Post, the resurfacing of the video has given Mlotshwa a chance at justice, almost three months after the incident. “He didn't have evidence to prove what had happened; it's only two weeks back that he decided to open the case. He didn't think anyone would believe him,” Mlotshwa's brother, Thobile, told local media, the Post notes. South African authorities have detained Willem Oosthuizen and Theo Martins Jackson in connection with the video. Both men appeared in court Wednesday; they face charges of kidnapping and assault with intent to do grievous bodily harm. A judge postponed their trial until January, but the men will remain in prison on remand. “This humiliation can be based on nothing else but his blackness, which means it is in actual fact a humiliation of black people as a whole,” the EFF said in a statement, according to the Post. The party has called for protests at the ranch where the incident occurred.